Over my first few days in Madrid, I quickly identified some first week essentials to help me settle into a new country. I purchased a phone plan from a European provider primarily so I could use Google Maps to navigate the streets J. However, I have friends who opted to bypass the phone plan and rely primarily on Wi-Fi and asking for directions, which has worked out pretty well for them thus far…so it’s up to you what route you want to take! If you do decide to get a phone plan, ACCENT staff typically recommend heading to The Phone House to purchase a SIM card if your phone is unlocked since they typically have a wide variety of options. They have multiple locations around Madrid, but I went to the one nearest to my homestay in Sol (address: Calle de Preciados, 19, 28013 Madrid) to check out the different plans. At the time, the Phone House only had plans from Orange, but I had heard from friends that Vodafone and República Mobil were also popular options and wanted to look around a bit more. Across the street at El Corte Inglés, you can find every cellular provider on one floor of the store! For 20 euro, you get 7 GB of data and 80 minutes of call time. Roaming is also included, meaning that the SIM card should work in other countries in the EU. While there are options to get 5 GB and some minutes for 15 euro and 3 GB and less minutes for 10 euro, the first time you purchase a card they require that you buy the “biggest option” for 20 euro. At the beginning of every month, you can reload with either the same or a smaller plan online, in store, or over the phone. I also recently found out that the aforementioned plans are only good for the first month! After that, the plans reduce by half to become 3.5 GB for 20 euro, 2.5 GB for 15 euro, etc. You can always change providers after a month if you decide to though! For 20 or 22 euros a month, you get 7 GB data and 60 minutes of calling. 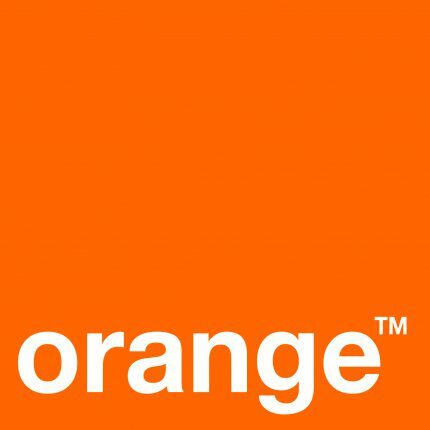 I’ve heard that Vodafone is similar to Orange in terms of Roaming plans for other countries in the EU! With República Móvil, you benefit from 15 GB & 100 min calling for 20 euro a month! From a friend’s experience, the plan did not immediately activate outside of Spain (roaming) but after calling customer service she made it work outside of the country. I didn’t opt for this plan because I thought 15 GB was excessive and was worried about the possibility of it not working outside of Spain. Regardless of which phone plan you choose, all of them should activate immediately after you enter in a PIN and configure your phone again. The entire process took less than an hour and so far, I’ve only used 2.5GB for 3 weeks…so needless to say 7 GB is a little much for me for the month, but it’s always good to figure out how much you typically use and then update the plan accordingly. 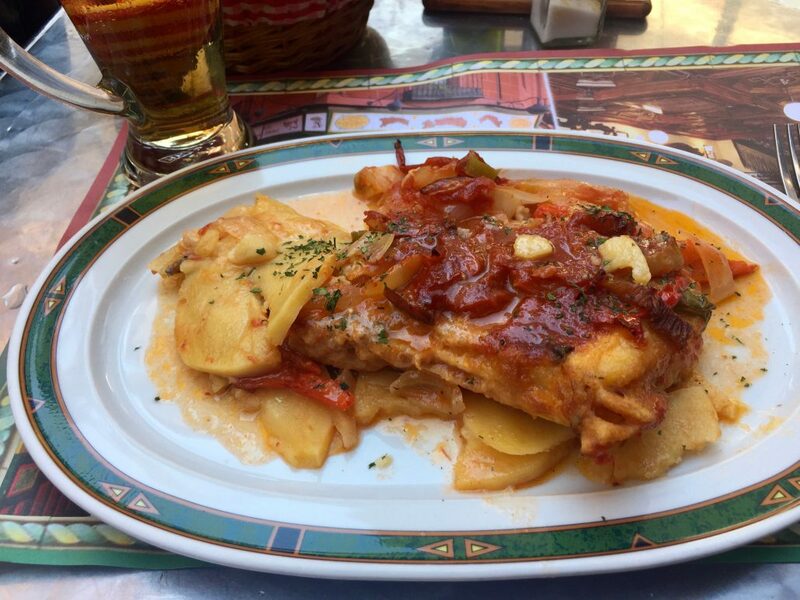 The first few days I was on the hunt for delicious, authentic Spanish cuisine and stumbled across The. Best. Thing. Ever. Menú del día. 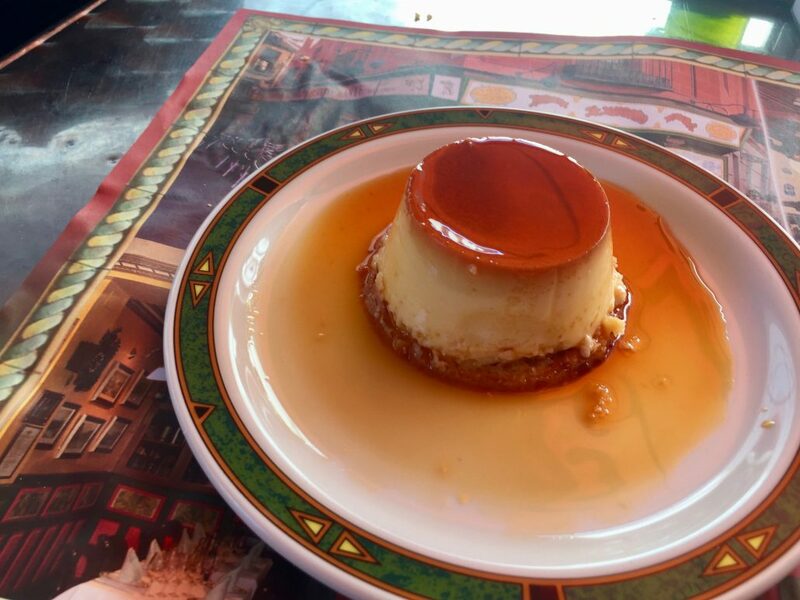 Typically, the menu of the day lets you select two dishes from a preset menu and includes a drink, bread, and dessert on top of the two entrees. So far, I’ve seen menus that are as cheap as 7 euro and as expensive as 15 euro, depending on how touristy the area is. The meal is also more expensive in some places if you opt to sit outside instead of at the bar. 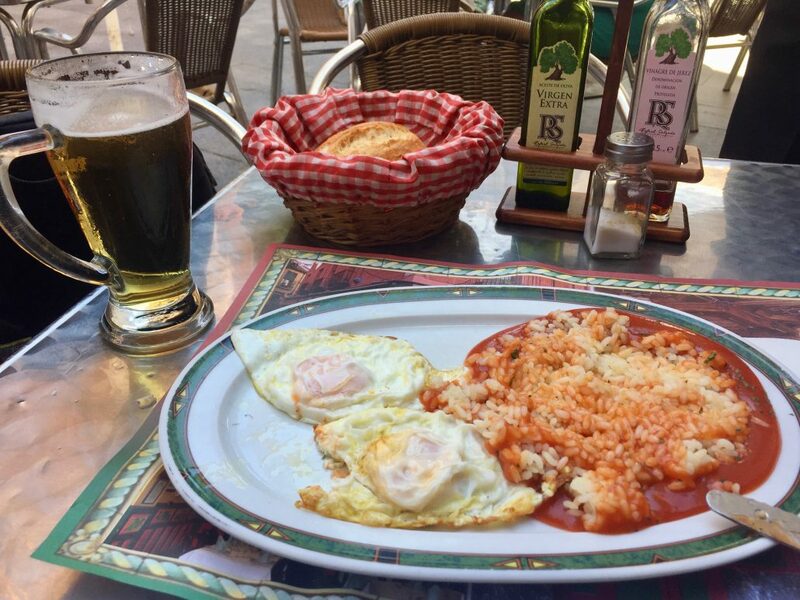 For my first full meal in Spain, I found a place off a side street near Plaza del España with a 10.50 euro menu (13.50 when sitting outside) and decided to splurge. While eating out is delicious, it gets a bit pricy to eat out every day. To save some money, I typically only splurge on a full meal a couple days a week and head to the other alternatives for grab-and-go around town other days. 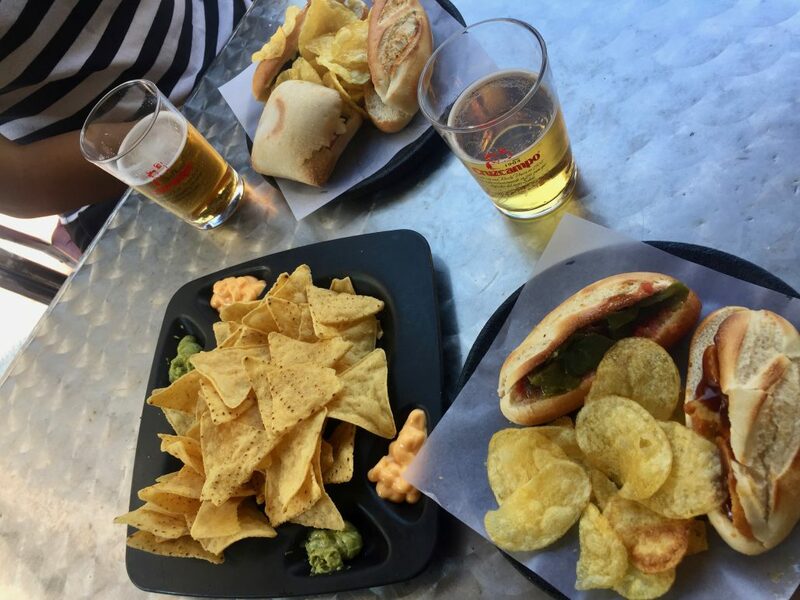 4 Euro meal at 500 Monteditos: Nachos to share, 2 sandwiches, and a drink! Definitely make sure to save a day or two to try all the menus places have to offer – hot food and good conversation can’t be beat! I grabbed some power adapters for my electronics (laptop, phone) when I got here, since Europe doesn’t agree with the style of US plugs J Luckily, these are available at the nearest Bazar (Spanish equivalent to a dollar store with a random compilation of snacks, toiletries, school supplies, and more!) for 2-3 euros each. I would recommend buying more than one adaptor initially since one of mine somehow broke after 3 uses…good thing they’re inexpensive! 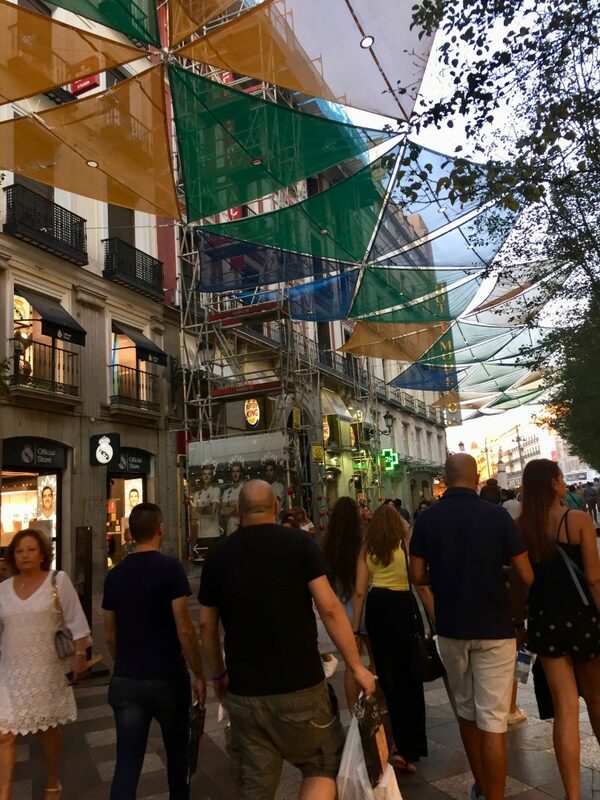 Sol is the center of Madrid and has an overwhelming number of places to buy clothes, shoes, electronics, household items, and more! 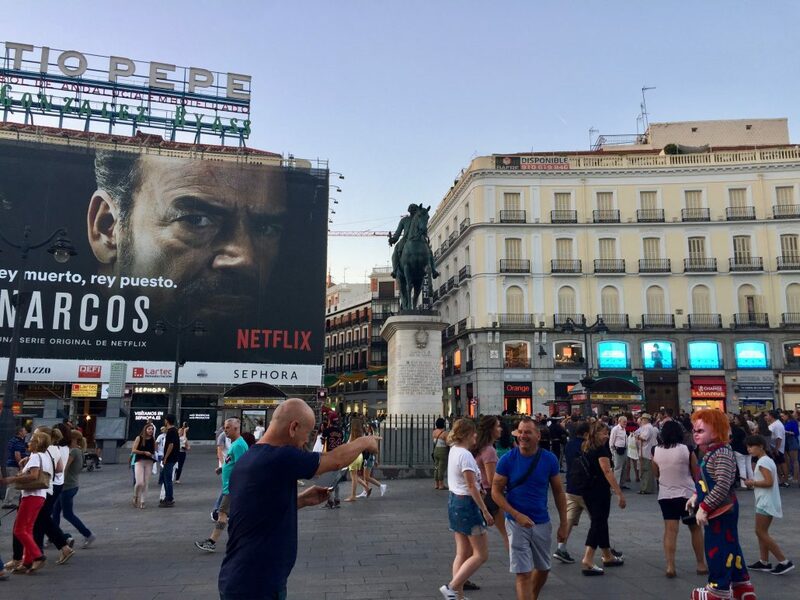 Gran Vía, the center of shopping near me, is just a 5-10 minute walk from Puerta del Sol and has all the large Macy-esque multilevel shops that your heart desires. If you’re looking for smaller shops, there’s a strip of stores and restaurants off of Tribunal metro station as well. Luckily, the end of August into the middle of September marks rebajas season (read: MID-SEASON SALES!!!) Lots of things are 10-70% off…so treat yourself to something nice. You’re in Spain and that means dressing like the Spaniards do (which is more business-casual business-chic than we usually dress in the United States)!